The book Genius in a Bottle is sold out. Thank you to all of the people who purchased a copy. 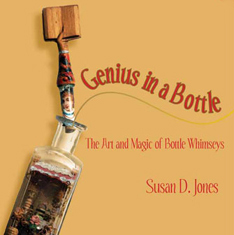 "Bottle whimseys," ("whimsey bottles," "puzzle bottles," or "whimsies") are constructions or scenes assembled inside bottles. The earliest known examples of the art form date from the eighteenth century, but most seem to date from 1880-1930. The most well-known form is a ship, but almost anything that can be built or whittled has been put into a bottle and can be seen here: crosses and crucifixions, fans, chairs, spinning wheels, wishing wells, photographs, buildings, tools, saloon scenes, fanciful bird trees and complicated interlocking puzzles . Follow these many links to explore this incredible subject, the obsessive and intricate world of whimsey bottles. The question I get asked most often is (thanks to Antiques Roadshow), "How much is this worth?" That I can't answer, but check out eBay for recent auctions. Carl Worner, the self-proclaimed "Master Whittler"
Experience two bottle whimseys in 3-D!! A bottle containing a scene of a saloon in Granite City, Illinois, was donated to the State Museum of Illinois in Springfield by the son of the bottle's original owner. The bottle was made by Carl Worner in about 1912. The museum published a short article about the bottle and its origins in their magazine, The Living Museum. Click here to read this article and see pictures of the bottle. The Museum of American Folk Art in New York city has a collection of whimsey bottles which were collected by B. H. Friedman who wrote an article in the Fall 1984 Clarion (the museum's magazine) about the bottles. The Missouri Historical Society in St. Louis, MO, was recently given a Carl Worner bottle made for a local saloon in 1908. The bottle was written up in their quarterly magazine, Gateway Heritage (Vol. 20, No. 1, Fall 1999); the article also talks about the role of saloons in city life around 1900. The society has an excellent website. They also have single copies of the magazine with the article on the Worner bottle. The South Street Seaport Museum in New York City has an important collection of ships in bottles which they acquired from the Seaman's Bank for Savings in 1991. Some of the bottles were made by model-maker Charles V. Nielsen, and others had been collected by the bank from other sources. The bottles are not on permanent display. The second most frequently asked question I get is, "Where can I get bottles like these?" Go to the Ames Gallery, Artisans, or David Smith, ship bottler, and folk art antique shows. • Folk Artist Lisa Rauter - maker of whimsey bottles and "memory jugs"
Images and descriptions of bottles. Click on any of the following categories to see pages of thumbnails. Click on the smaller picture, or use text links, to see a larger picture and closeups of each bottle. Text-only list of bottles, grouped by subject and linked to each bottle's page; new bottles flagged.